The Lost Reviews are a group of articles I wrote for the site DVDWolf that, for whatever reason, were never posted. This review for Day Watch was originally written in June 2007. In the second part of the trilogy, Anton (Konstantin Khabensky) tries to get back his son Yegor (Dima Martynov), who now resides with the Dark Others. To add to Anton’s problems, Zavulon (Viktor Verzhbitsky) continues his plans to break the truce between light and dark, by framing Anton for murder. “That made so little sense to me”, said the guy sitting next to me when the lights came up. I could see where he was coming from. Without the foundation of the previous film Night Watch, it must be maddening to try and keep everything straight. A five-minute recap for the previous two-hour film at the start of Day Watch just isn’t going to cut it with the casual viewer. Since Night Watch didn’t even get so much as a look by domestic distributors, most people are unfortunately going to be in this position. It’s a really weird move by Fox Searchlight that still leaves me scratching my head. All right, now that is out of the way, let’s assume that you are up to speed on what is going on. Is Day Watch any good? I think it is safe to say that if you liked Night Watch, you’ll like Day Watch. If you are already onboard with Bekmambetov’s eclectic style and gimmicky effects, this should be an engaging ride for you. 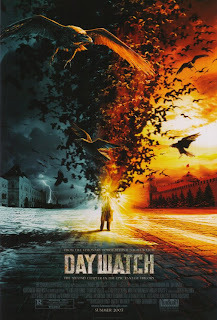 There are more than a few points where Day Watch seems to be coming off the rails, but I find the story just so damn interesting, that it somehow keeps me in it. Whoever designed the subtitles managed to up the quirkiness of the series by making them interactive. The subtitles actually react to the stuff happening onscreen, such as being slashed by swords and jostled by loud noises. Yes, it’s another gimmick, but it truly showcases the creativity at the heart of this trilogy. The story is dense and the characters number in the dozens, most of whom were in the previous installment. There is less action in this one though, so some may come away disappointed. Amid all the craziness, that includes tango dancing, gravity defying vehicles and runaway Ferris wheels, there is a good mythology built up here. I will definitely check out the upcoming third and final part, Dusk Watch. For anyone else, I can’t stress enough that you check out Night Watch first and then decide whether you’d like to continue further into Bekmambetov’s chaotic world.